There are a few new Pedal Folk recordings in the making – here is a sneaky peek at one I finished mixing today. This entry was posted in Music, News and tagged bass, cello, chance kellner, clarissa carlyon, flute, folk, guitar, naomi wilkins, robin grey, tim graham, traditional on March 5, 2016 by Robin Grey. We are super excited to announce that we will be kicking off ‘Pedal Folk V’ at ‘Roll For The Soul‘ in Bristol on Friday October 3rd. Roll for the Soul is a delightful not-for-profit bike café, workshop and bike shop in the centre of Bristol. Their vision is to become a focal point for cycling in the city, celebrating and supporting every wonderful aspect of our cycling culture and to offer a city centre space where interesting things can happen… Basically, a village hall slap-bang in the middle of Bristol. Here is what is looks like empty…. We have also been invited back to The Bell in Bath on Sunday 5th October… now just need to find somewhere lovely for Saturday night. 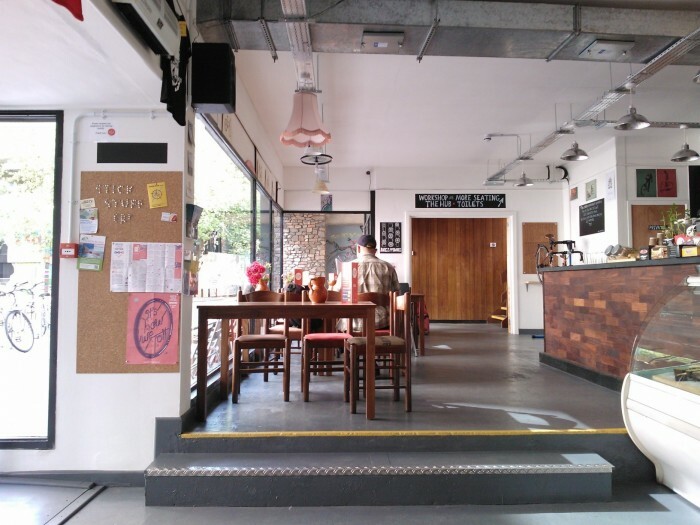 This entry was posted in Gigs, News and tagged bristol, chance kellner, cycle cafe, cycling, folk, music, robin grey, tim graham, tour on June 27, 2014 by Robin Grey. This entry was posted in News and tagged chance kellner, cycling, edward thomas, folk, guitar, in pursuit of spring, map, music, route, singing, songs, tim graham, violin on February 10, 2014 by Robin Grey.